Hi. 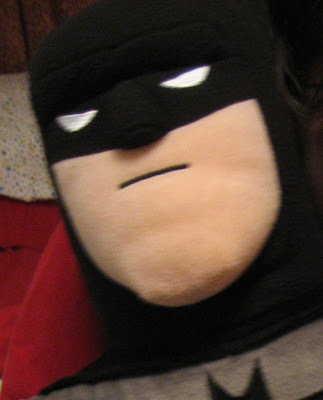 Cuddle Pillow Batman here. I just wanted to let you guys know that Rachelle is having a rough couple of weeks and she needs a bit of personal time. I assure you she has not lost interest in this blog, she just hasn't had time to post anything lately. She wants you guys to know that she thinks Bucky will make an excellent (and dreamy) Captain America. He just needs to figure out a better way of dealing with criminals than shooting out their kneecaps. I mean...Rachelle could do that. So Rachelle is very sorry for the lack of posting lately, but she promises to be back soon with lots of comic love. In the meantime I'll be on active cuddle duty.